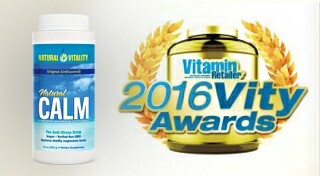 Vitamin Retailer magazine once again polled its retailer readers on their top-selling products and best sales and merchandising support to compile its 2016 Vity Awards. After all, who is better qualified to determine the industry’s best-selling products than the people who sell them? Multi-award-winning Natural Calm is the bestselling magnesium supplement in the natural products market year after year. Natural Calm supports heart and bone health, better sleep, natural energy production and natural stress reduction. Natural Vitality uses only organic flavors and organic stevia. In addition, Natural Calm is vegan, gluten free and certified non-GMO (genetically modified organism).